Every morning I wake-up to the tick-tock of a racing clock reminding me of the uncertainties I face in the near future. Like a heavy grandfather clock, the passing time tells me I bear the responsibility of my aging parents, who will soon need me to have solutions. I can only imagine all the ways that my own family will be affected as I attempt to bring security to my children’s grandparents. I hurt for the helpless feeling my parents are beginning to experience as time seems to be leaving them behind. It’s amazing how many hours in the day there are to worry and run through scenarios: while folding laundry, driving kids around, and washing dishes. But there is so little time to spend researching options. I have managed to come up with three potential solutions as I prepare to care for my mom and dad when the time comes. And the beautiful prefab log cabins from Leland’s Cabins have me the most excited. The simplest option may be to move, which says a lot! Anyone who has ever moved knows what a job that process presents. Preparing our home to be staged and keeping it perfectly picked up, all while my three boys and puppy are still living in it, is anything but simple. At a moment’s notice, we all jump in the car and find someplace to hang out while strangers walk through our home judging its every imperfection! Besides, we love our home. We love our community. Our kids don’t want to change schools, and they shouldn’t have to be uprooted. We could add an addition to our home to meet the needs of our integrating family. I remember how much fun that was as a teen when my parents decided to biggie-size their house while we were living in the middle of the construction zone. There was dust everywhere and construction workers peering around in private places. Sometimes the water had to be shut off and I wouldn’t get the memo before missing my opportunity to shower, not to mention it was often simply not safe to live there. Even a hard hat wouldn’t have protected me the morning that a worker accidentally broke my bedroom window and glass poured over my bed. I don’t really want to go through that again. Home additions never go as planned. They cost more than expected and take longer than promised. Nevertheless, if I don’t want to move, I am looking at $80 to $200 per square foot, so around $110,000 depending on how carried away I get in the design. The fact that I even looked into this option makes me feel a little like an evil stepchild. But this is a really big decision, and it would be irresponsible not to consider every available alternative. Continuing Care Retirement Communities (CCRC) could actually be a lot of fun … if you’re loaded. If my parents didn’t have to budget their income or if I won the lottery and wanted to generously donate it to my parents’ retirement, they could basically live on a resort with as much independence as they want while easing into greater assisted living as needed. They could rent, or they could own as much as one who purchases a condo can truly “own.” But the amenities for CCRC are quite diminishing for more limited incomes. And I don’t play the lottery. Lastly, there’s the cabin option, which almost seems too good to be true. I took the log cabin showroom tour with my friend who told me about Leland’s Cabins, and a surprising new hope began to spring up within me. My anxieties about losing my privacy and uprooting my family dissipated. It seemed like it could be an affordable option, with nine cabin styles ranging in sizes and prices from $18,000 to $196,000. And they’re beautiful! I still need to check with my city to see if they will allow us to put another home on our property. And, of course, I need to have “the talk” with my parents, which I am not looking forward to having. It could potentially offend them that I would suggest they are needing assistance. Or it could totally backfire! They could become so excited they jump the gun and move here ASAP. At least I know it only takes about eight to 10 weeks to have a move-in-ready cabin delivered. 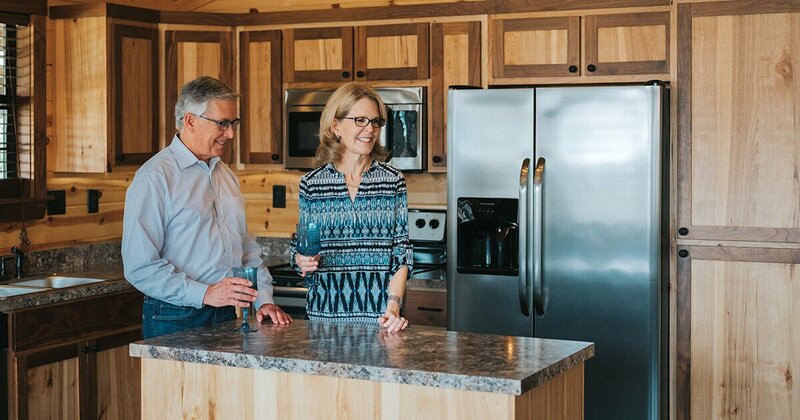 If you’re like me, getting to know Leland’s Cabins prefab log cabins is the best bet for juggling aging parents and active kids. Contact Leland’s today and learn more about your options. Rebecca is a published author and blogger whose greatest passion is connecting with her family. She spends her days wondering how her children have outgrown her already and when exactly did these lines appear on her face. With just a few years left before her boys begin to leave the nest, her goal is to make as many memories as possible before they spread their wings. She also enjoys reading, writing, traveling, restaurants, red wine and quality time with her husband and friends.